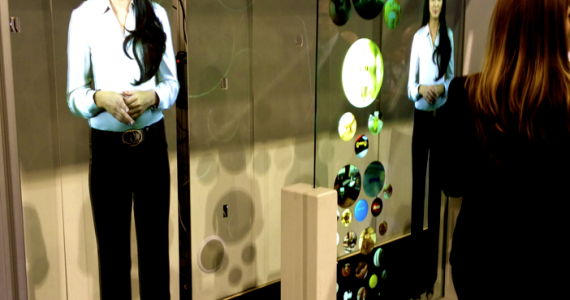 The digital signage expo – held March 6-9 in Las Vegas – surely lived up to its name. With nearly 100 exhibitors – including pixel-pushing giants such as NEC, LG, Sony, Panasonic, and Samsung – there was a massive amount of displays on, well, display. Digital screens continue to get larger, sharper, and more vivid each year.. but they are also getting more interactive, adding more dimensions, and becoming true windows into our digital world. DSE participants are certainly hocking their shovel-ready technologies, but they are also there to earn mindshare by drawing attention to the innovative products in the pipeline.